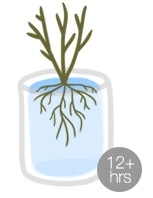 Soak the roots in tap water for at least 12 hours. 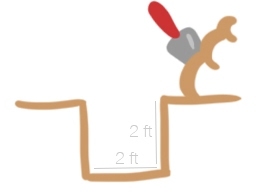 Dig a hole 2 feet wide by 2 feet deep. Try to enjoy this (or train your dog to help). 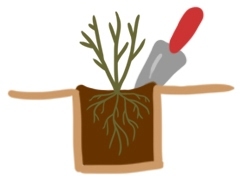 Mix equal parts soil with any type of compost. Put rose in center of hole, and fill with soil/compost mixture. The base of the stems should be a few inches above ground level. Form a shallow, bowl-like depression around the stems to aid water retention. Water immediately and gently. Provide so much water that it fills the depression around the plant. 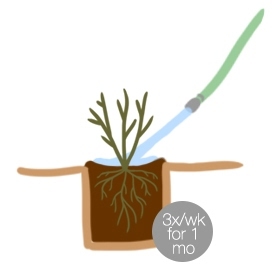 Three times each week for one month after planting, continue to water thoroughly. Then water as needed. Illustrations by Maya P. Lim for RosesbyPing, protected by copyright.